Much of the blame for the course of events which weakened the prospects of Russia’s first attempt at democratic government must be borne by the Provisional Government. The Provisional Government, as its name implied, saw itself as a temporary administration whose main task was to prepare the elections to a Constituent Assembly. It was expected that the Constituent Assembly, when elected on the basis of a democratic electoral law, would consider and approve the key principles of Russia’s future constitutional system and create permanently functioning governmental institutions. The ministers of the Provisional Government were in their majority supporters of the rule of law and did not want to prejudge or resolve the issues which, they thought, were outside their mandate and should wait till the convocation of the Constituent Assembly. The core of the Provisional Government was formed of liberal Kadets, such as Paul Miliukov or Alexander Manuilov, who understood the importance of the idea of a properly ‘legally based’ democracy. They knew that without this ‘democracy’ would be a cloak for arbitrary decision-making based upon the principle ‘might is right’, or on expediency. The awful paradox is that in this view the legalistically-minded ministers were absolutely correct, but the situation they faced made such a view impossible to carry out. 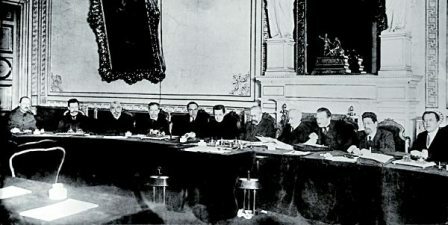 The Provisional Government did not want to prejudge not only the decision on the form of the future Russian State, but also such vital questions as the ownership of land and the conclusion of peace with Germany. For peasants (and the overwhelming majority of the Russian population, including most soldiers, were peasants) the real issue of the revolution was land. Yet the Provisional Government refused to act, arguing that only the Constituent Assembly could undertake so fundamental a redistribution of Russia’s resources. In the meantime peasants started to take gentry land anyway, knowing that the government could no longer stop them. Above all, it was the government’s decision to pursue war to victory that proved to be its biggest mistake. The Provisional Government felt obliged to continue the war because they accepted the treaty obligations to Great Britain and France which forbade the conclusion of a separate peace by any of the Allies. They were ‘legalistic’ about this, and they also believed that since Russia was now on its way to ‘democracy’, the ‘democratic allies’ - Great Britain and France - were its natural partners against Imperial Germany and Austria. The ministers in the Provisional Government hoped that victory in the common struggle would entrench in Russia a form of government similar to the constitutional regimes of its allies. Also the Western allies themselves were all the time putting pressure on the new government in Russia to stay in the war. In addition, there was a huge logistic problem. In the spring of 1917 Russia had seven million men under arms. How could Russia cope with such numbers if the war ended and so many troops would have to be transported home? Later most of them ‘transported themselves’ anyway, but the Provisional Government could not have officially ‘ordered’ them to quit the trenches and go home. Whatever the motivation behind the government’s resolve to continue with the war effort, their decision was extremely dangerous, for they grossly underestimated the depth of the anti-war mood of the masses. Most of Russia’s peasants, workers and soldiers had no longer any desire to fight. Peasants in the army could not wait for the land repartition which they knew was about to take place. They deserted in increasing numbers to go back to their villages to ensure they did not miss out on their share of the gentry land. Thus, the reservations of the ‘legalists’ in the Provisional Government prevented it from taking bold steps which would have gone at least some way to meet the expectations of the masses and significantly transformed the country’s socio-political system. As a result, it restricted room for its own political maneuver and lost the initiative to the ultra-radical political forces. A speedy convocation of the Constituent Assembly might have solved some of these problems. Yet the government claimed that wartime conditions made it impossible to hold elections. Eventually it set up an electoral commission in May and promised elections in November. However, its procrastination over the issue had planted the suspicion that a ‘bourgeois’ government was deliberately avoiding elections which might result in its overthrow. Both the actions and the inaction of the Provisional Government increasingly alienated the working classes and the leftist forces. In their eyes the Provisional Government lacked legitimacy. The Soviet, by contrast, was ‘their’ government, the symbolic representative of Russia’s exploited classes. Other reasons as well prevented the Provisional Government from taking stock of the situation and making right political decisions. The Russian bourgeoisie, which it mainly represented, had not yet accumulated enough political experience and mastered the skills of public administration. It was not adept, like its more experienced West European counterpart, in reaching social compromises and making political deals. In addition, it was not always capable of differentiating clearly between its long-term strategic interests, such as holding on to power and maintaining its dominant position, from short-term, tactical ones. These latter often overshadowed the former and included the undisguised desire of industrial and financial bourgeoisie to preserve large-scale private land ownership (many estates of the nobles by 1917 had passed into its hands). The bourgeoisie was also interested in the continuation of the war, because it brought it huge profits and promised territorial gains and new trade and economic advantages in the event of victory.